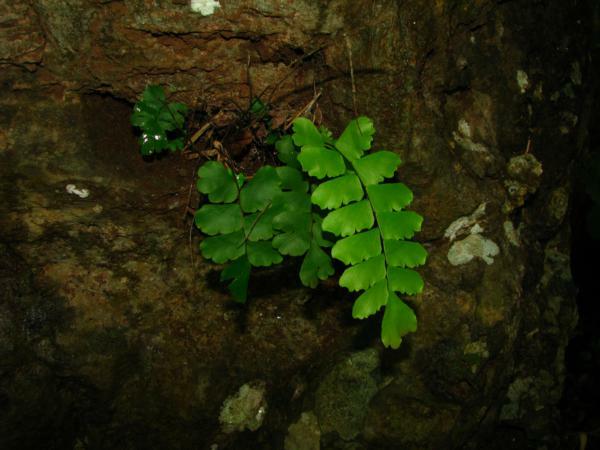 Adiantum soboliferum Wall. ex Hook., Sp. Fil. 2: 13, t. 74A. 1851; Tardieu & C.Chr., Fl. Indo-Chine 7(2): 181. 1940; Holttum, Rev. Fl. Malaya ed. 1, 2: 598. 1955 [‘1954’]; Ching, Acta Phytotax. Sin. 6: 820. 1957; Seidenf., Nat. Hist. Bull. Siam Soc. 19: 87. 1958; Tagawa & K.Iwats., SouthE. Asian Stud. 5: 109. 1967; Tagawa & K.Iwats., Fl. Thailand 3: 211, f. 16.2. 1985; Boonkerd & Pollawatn, Pterid. Thailand: 118. 2000. 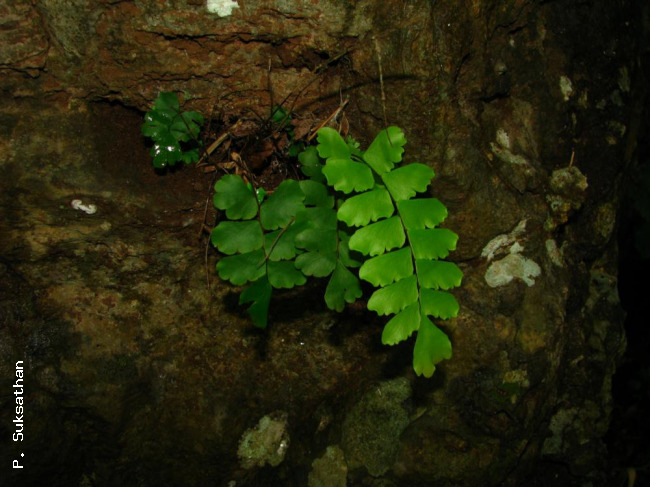 – Adiantum caudatum var. soboliferum (Hook.) Bedd., Handb. Ferns Brit. India: 84. 1883. Terrestrial or lithophytic. Rhizome erect, with dark brown linear-lanceolate scales; scales linear, 5–7 mm long, concolorous golden brown, margins entire. Stipes and rachis shiny, dark brown to black, scaly at base, otherwise glabrous, 8–18 cm long, narrowly winged throughout with wing c. 0.7 mm broad; old stipes and rachises persistent. Laminae mid green above, slightly paler beneath, 9–35 by 3.5–7 cm, thin, rachis and pinna-stalk rather densely hairy on upper surface, lamina glabrous; pinnae 5–15 pairs, stalks 1–8 mm long, dimidiate and almost oblong, 2–3.8 x 0.9–1.9 cm, reducing in size towards apex, upper margin 4–7-lobed, lower margin slightly incurved, inner margin straight; veins dichotomously branching, distinctly raised on lower surface. 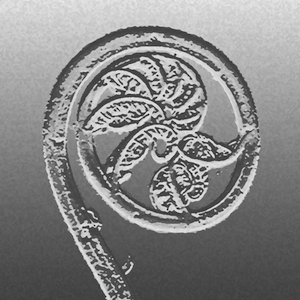 Sori 3–8 per pinna, false indusia green when young. Bulbil rarely present at tip of frond . NORTHERN: Mae Hong Son, Chiang Mai, Chiang Rai, Lamphun, Lampang, Tak; NORTH-EASTERN: Loei; EASTERN: Chaiyaphum, Nakhon Ratchasima; SOUTH-WESTERN: Prachuap Khiri Khan; CENTRAL: Nakhon Nayok; SOUTH-EASTERN: Chanthaburi; PENINSULAR: Surat Thani, Trang, Satun. India, S China, Taiwan, Indochina, throughout Malesia to the Pacific tropics. On rather dry ground in deciduous or evergreen forests at low or medium altitudes. Middleton et al. 4973, Mae Hong Son, Tham Lot cave area (E); Middleton et al. 4507, Chiang Mai, Doi Inthanon National Park (E); Middleton et al. 4816, Lamphun, Mae Ping National Park (E); Van Beusekom et al. 4130, Chaiyaphum, Nam Phrom (P). Thorel s.n., Champasak, Kong (P). Maxwell 01-249, Rattanakiri, Lom Pat, Yak Ohm (CMU).